1. Dissolve the sugar in 1/2 cup warm water. Use a thermometer to ensure the water is 100 degrees F, then sprinkle the yeast on top. Let sit for 10-15 minutes. The mixture should start to bubble up. After about 15 minutes, stir well. 2. In a large bowl mix together the flour and salt. Rub the softened butter into the flour with your fingers until well mixed. 3. Add the yeast mixture to the flour, along with an additional 1 cup of warm water. Mix together with your hands until of a consistency that can be kneaded on the countertop. Knead gently with the palm of your hand until smooth – this shouldn’t take longer than 5 minutes. If you find the dough too sticky, add a few extra tablespoons of flour; if too dry, add an extra tablespoon of water. 4. Form the dough back into a ball and lightly coat with a little oil. Place the dough ball in a medium bowl and cover with a paper towel, let rising in a warm place for an hour and fifteen minutes. In this time the dough should double in size. At this point, you can start preparing the cheese mixture – see below. 1. While the dough is rising in the bowl, begin grating the cheddar cheeses, then add the small pieces of Velveeta. Don’t worry about the Velveeta being difficult to break or cut into pieces; you’ll be squishing this into a paste, so aesthetics won’t really matter. 2. Add the egg, flour and spices (don’t use the sesame seeds yet). Mix well. 3. Preheat oven to 400 degrees F. When the dough has fully risen, punch down the dough in the bowl, then break off small lemon-sized pieces and roll these into small balls. Place the balls directly on a lightly oiled baking sheet and press then down and apart gently with your fingers. Typically you’ll want to make them about 3 inches round, but you can make them as small or as large as you want. 4. Place 2-3 tbsp of the cheese mixture on each round dough, spreading them out of even thickness on each circle. Leave a slight edge of dough showing around the circle. 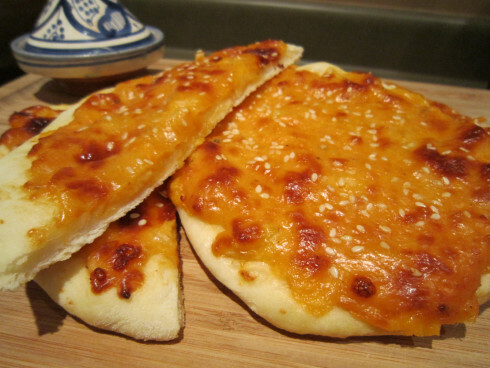 Generously sprinkle the cheese mixture with the sesame seeds, then press down with your fingers. 5. Bake about 18-20 minutes or until tops of the cheese pies are golden. Let cool on a wire rack.